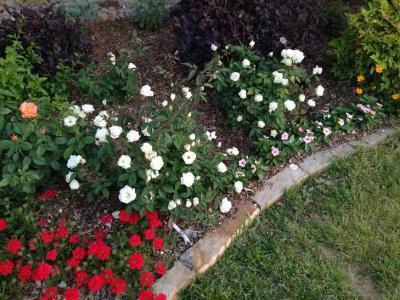 Groundscape Solutions, A Fort Worth Landscaping Company planted a flower bed with Ducher Roses. Ducher is a White China Rose that grows to a medium height of about 6ft. They bloom Ivory White with a very double bloom. Ducher Roses bloom spring, summer, and fall and have a fragrance. The new growth on a Ducher Rose is bronze in color. These roses are to be planted in full sun and do require maintenance because of their height. Ducher Roses are disease resistant and drought tolerant. Duchers are also thornless so you wont get pricked when prunning. Planted beside the Ducher Roses are Red Verbina Roses for a nice contrast in color. Give us a call at 817-759-0102 for a quote and visit our website at www.groundscape.com Groundscape Solutions is a fully insured Landscaping Design Company and will provide references.